Ever stood on a pitching mound and noticed the rubber was twisted in one direction or the other? While most might think that it is not a big deal, ask a pitcher, a pitching coach, or a trainer how this seemingly minor turn can have major effects on a pitcher’s mechanics and even the health of his or her arm. A pitching rubber that is just slightly turned by ¼” on a Major League mound will move the centerline off-center from home plate by 1.15°, or 14-½”. 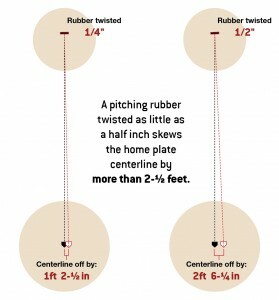 A rubber that is twisted just a little more to a ½” will throw the centerline off by 2.39°, or more than two and a half feet! That can mess with a pitcher’s mechanics, increasing wear on a pitcher’s arm as they work to compensate for the misalignment. While the apex of home plate is the benchmark of a ballfield — where everything is laid out with respect to — the pitching mound and its rubber are equally critical to ensure proper alignment and function for a pitcher. There are 4 parameters that require absolute perfection in order to successfully install a pitching rubber to specification — elevation, distance, level, and square. Because they are interdependent, anytime you move or adjust any of these four parameters, you’ll likely need to double-check the other three to make sure they are all still correct. ELEVATION: The elevation of the pitching rubber is measured with respect to the elevation of home plate. When someone says the mound is ten inches tall It means that the surface of the pitching rubber is exactly ten inches higher than the surface of the home plate. Most infields have a slope from the base of the mound down towards the baselines and bases in order to facilitate surface drainage off the infield. This will take away some of the height that you will build your mound up to. For instance, if you have three inches of fall from the base of the mound to home plate and you have to build a ten inch high mound, then the actual mound of soil you will build should only be seven inches in height. It is easiest to use a transit or builders level to help measure the elevations of the surface of the home plate and the surface of the pitching rubber to insure the correct change in elevation between the two. Some fields will have irregular surface grades and may tilt in odd directions. In these situations, it sometimes might be easier to build the mound 10″ higher than the ground immediately surrounding it. DISTANCE: When the rule book lists the pitching distance for a ballfield, it is describing the distance from the apex of home plate to the front center of the pitching rubber. By the way, that is the apex of the white portion of home plate, not the black portion. This distance should always be measured using a steel tape when possible. Fiberglass tapes can stretch considerably over distance thereby threatening the accuracy of the measurement. LEVEL: Now that you know precisely where the rubber will be located, it’s time to level it. Level is checked in two directions on the rubber. From side to side and front to back. A torpedo level will work best for this portion of installation. Be sure that the pitching rubber you are working with does not have any bubbling of the rubber going on. This can make it almost impossible to level the rubber. SQUARE: Once the pitching distance is correct, then checking to make sure the rubber is square to home plate is the next critical measurement and alignment. On the pitching rubber scribe a line with a pencil or pen marking the centerline of the pitching rubber. Then, run a very tight string line from the apex of home plate to the center of second base. Pop the string three to five times to get an idea where the line is settling on average. Ideally, the string will fall on to the center line drawn on the rubber each time. Next, to be able to accurately determine if the pitching rubber is square, you’ll need to measure from the square portion of home plate. On the rubber, measure out in both directions 8-½” from the centerline and make a mark at those points on the front of the rubber (see illustration). Using the Measurements Table, find the pitching distance for your ballfield and reference the squaring measurement. Measure the distance from the front square corner of home plate to the front of the pitcher’s rubber at the 8-½” mark you made earlier. Repeat this measurement on the other side, from the opposite corner of home plate to front of the pitcher’s rubber. These two measurements should be the same when home plate is square to the pitching rubber. 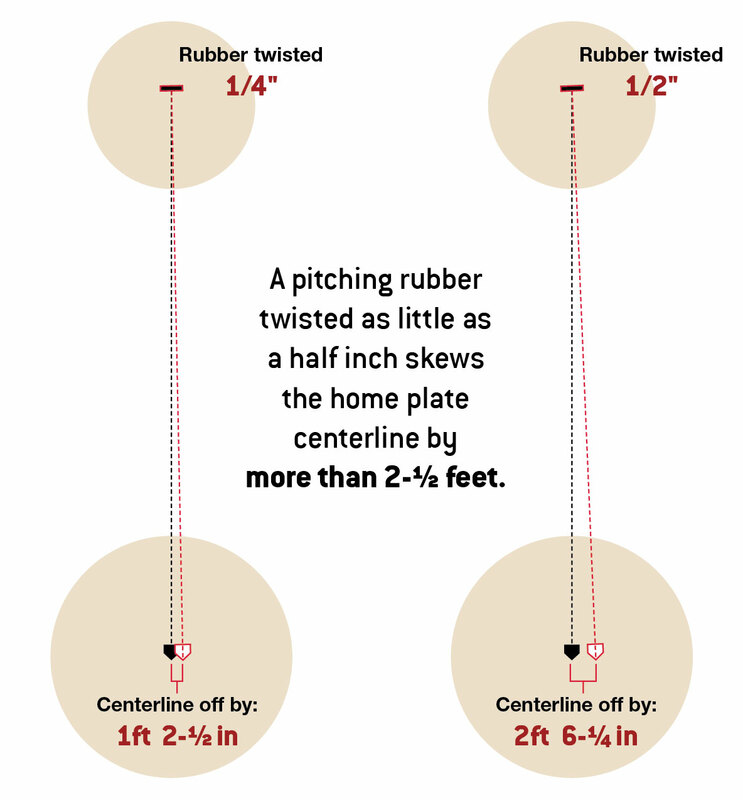 If these measurements are not the same, then the pitching rubber needs to be adjusted by twisting it ever so slightly until the measurements to match. Each time you manipulate the rubber to bring it square, you’ll need to re-measure the pitching distance and the two squaring measurements on each side of the rubber until they all meet the specified distances shown on the chart. When all of these 4 parameters have been met — elevation, distance, level, and square — make sure to double-check all of the measurements one last time before finally backfilling around the rubber. After compacting around the rubber, do one final check on level, distance, and square to insure the compacting process did not throw the rubber off its mark. Installing a pitching rubber can be a tedious task, especially if you have never done it before. Setting the pitching rubber is one ballfield task that demands both accuracy and patience. It can take as little as 15 minutes to set the rubber, or it can take as much as an hour or more. In either case, precision is the ultimate goal.